The strictly New Zealand grasses are absolutely beautiful. Their plumes form in late spring and last throughout summer, and they are as iconic as the Cabbage tree. Unfortunately the Argentinean version has invaded, and turns up in many older planting schemes. Oops - it even turned up in the Moosey Island Bed. 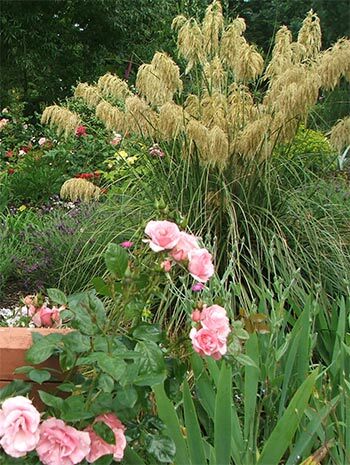 Argentinean Pampas Grass is a menace - it loves the New Zealand climate and grows far too large far too quickly. It simply cannot be grown in a smaller, suburban garden. Rats like to live in the base, where they can make comfortable hiding holes. Aargh! Toi Toi is a common spelling for this grass, though Toetoe is preferred by botanists. They are both Maori words, and both sound the same! There are four similar species (Cortaderia toetoe, Cortaderia fulvida, Cortaderia splendens and Cortaderia richardii) found in different areas in New Zealand. 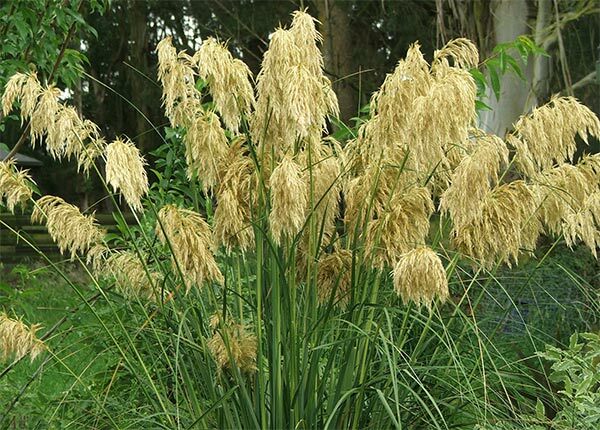 They are all closely related to that undesirable introduced Pampas grass (Cortaderia selloana or Cortaderia jubata). I bought my grasses from a native nursery. I checked the label very carefully - my plants were Cortaderia richardii, or South Island Toetoes. Perfect! Finally, after years of falsely nurturing an imposter (oops), I have the real thing. I'm pleased to see the grasses bounce back after the unhappy garden experience of the big mid-winter snow storm in 2006. They flower at the right time of the year. And I'm proud that I've sourced natives which hopefully suit my climate and area. I think I've got it right this time!